If cuddling koalas and cruising the coastline are what you look for in a great holiday, then pack your bags for Noosa Heads. Located on the north end of the Sunshine Coast, this beachy spot is all about kicking back and chilling out. 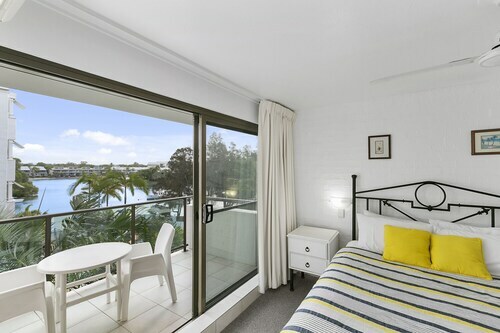 Whether you’re window shopping through vintage boutiques, charging some waves on a longboard, or making new friends at the national park, Wotif’s Noosa Heads accommodation will complete your fabulous holiday. Check out our Noosa Heads travel guide and don’t forget the sun cream! How do I get to Noose Heads from the airport? Wouldn’t it be great if you could float there on a swan raft? Well, you can’t, but the 30km drive from Sunset Coast Airport to your Noosa Heads hotel is just as pretty. Just follow Route 70 to Route 6 all the way up the shore. There are a couple bus routes that will take you directly from the airport to Noosa Heads, but plan on renting a car if you want to bring your own surfboard along. 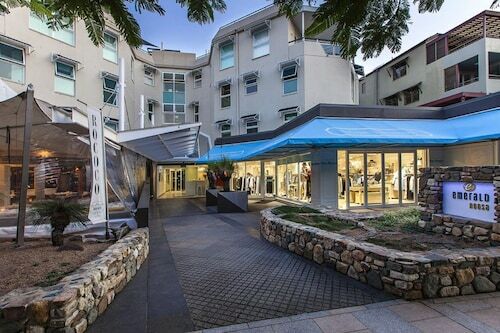 What are the most popular hotels in Noosa Heads? What kinds of hotels are in Noosa Heads? Noosa Crest: With its unbeatable location within walking distance of historic Hastings Street, lots of shopping and dining, and the blond sand at Noosa Main Beach, Noosa Crest is already awesome. Add in private balconies and fully equipped kitchens and you might want to move into this holiday apartment permanently. Noosa Springs Golf Resort & Spa: Wake up refreshed and enjoy the morning paper on the patio—or get warmed up in the fitness centre before a round of golf at the nearby Noosa Springs Country Course. The in-house soaking pools and day spa are the perfect treat for staying under par or hiking in Noosa National Park. Where should I stay if I’m visiting Noosa Heads? Noosa Heads Motel: Keeping it simple as you surf the Sunshine Coast? Stay at Noosa Heads Motel, where you’ll be a short distance to the beach and Laguna Lookout without splurging on beachfront property. Besides, the adventure continues, and you have a goal of surfing your way to top-notch Townsville accommodation! RACV Noosa Resort: One of our most beloved hotels, staying at this resort will be the bright spot in your year, and not just because of the floor-to-ceiling windows and private balconies. RACV Noosa is ridiculously close to Ross Island, Laguna Lookout and of course the beach. What are some things to do in Noosa Heads? Go to the beach. Well, yeah! Noosa Heads Main Beach isn’t just for sunbathing. Swim, snorkel and surf in these deep turquoise waters. Chart a path through Noosa National Park. On second thought, it’s a good idea to stay on the trail. The scenery is gorge and you just might meet a koala or two (or five)! Don your floppy sunhat and wander aimlessly down Hastings Street, the area’s historic centre. It’s loaded with delicious dining options and unique shops. If we had you and “cruising the coastline”, then it’s time to book accommodation in Noosa Heads and catch a ride to the airport. You’ll save even more on flights and hotels when you score one of our Noosa Heads holiday packages. Mix and match travel deals like your bathers and sunnies and let’s go! How Much is a Hotel Room in Noosa Heads? 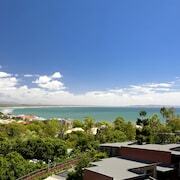 Hotels in Noosa Heads start at AU$189 per night. Prices and availability subject to change. Additional terms may apply.